PS: Great signature line you have and how true it is. 2016-2017 woodcock season is a wrap. 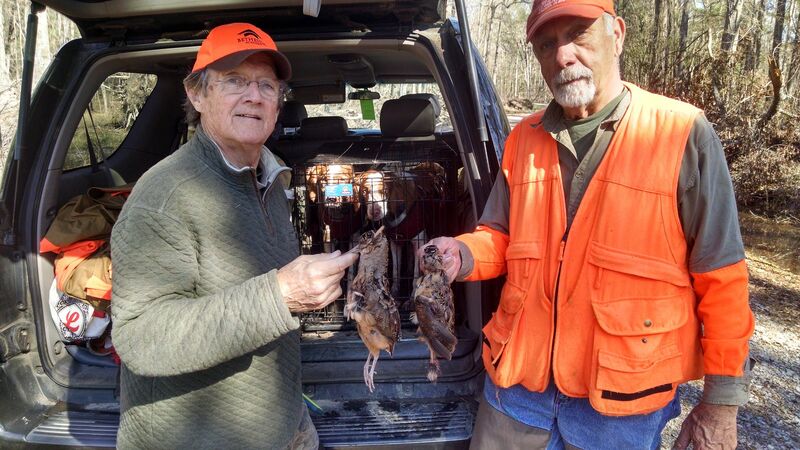 Floyd, Billy, Willa, Abby and I went this a.m. (31st) and found a few birds, 7, and managed to put two in the bag. It was a great season for us. Viewer’s left to right: Billy, Abby, Willa and Floyd, the Woodcock Whisperer. Last photo is Abby 4 seasons ago. Jeff, Floyd and I had a three gun limit on the last day of the season, three years ago today. 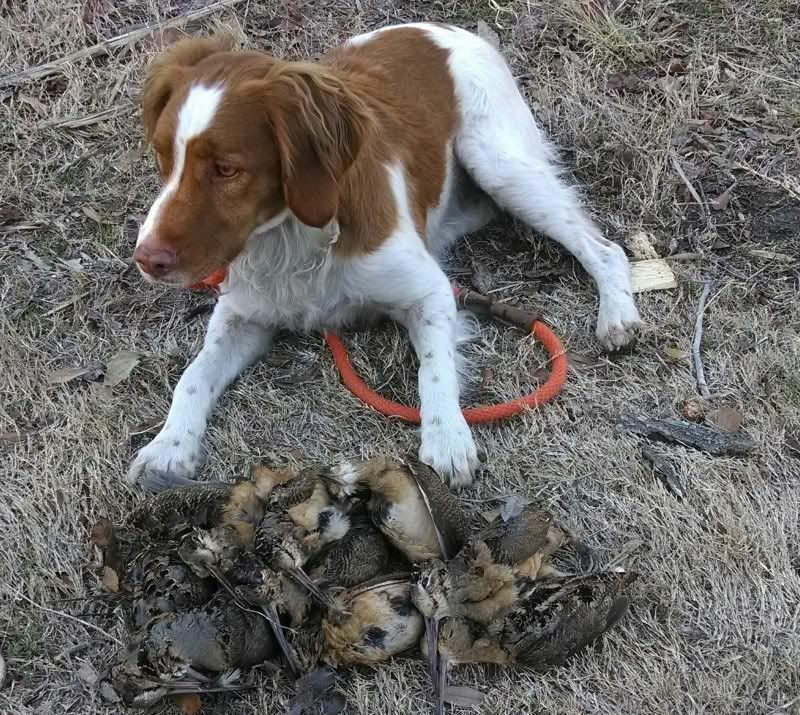 Abby is the glassy-eyed and one tired dog with the birds. She was on the ground all day. The late Snap and Pop alternated during the hunt and Willa hadn’t been born. I closed out the season over the weekend; I have to say it was brutal. 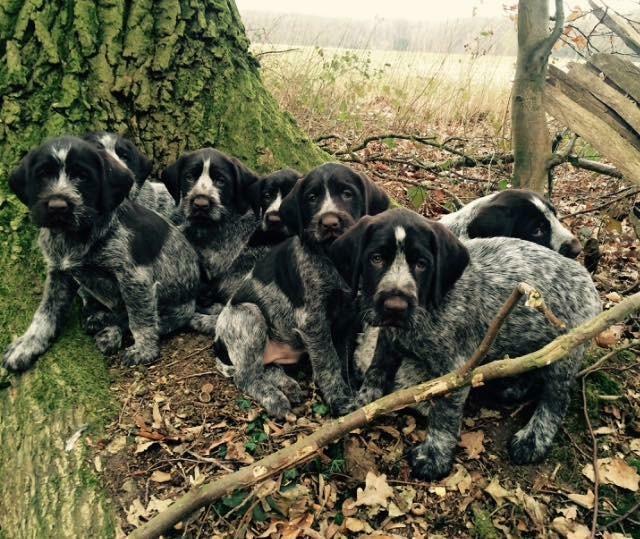 Three of us hunted about eight hours on Saturday and about six on Sunday. My nephew got one rooster on Saturday and I got one on Sunday. My brother-in-law never fired his gun. F2F, Mike, not just natty. 1898, too. Y'all are just jealous of Kansans. Dapper for sure. Those LLBeans are cool. 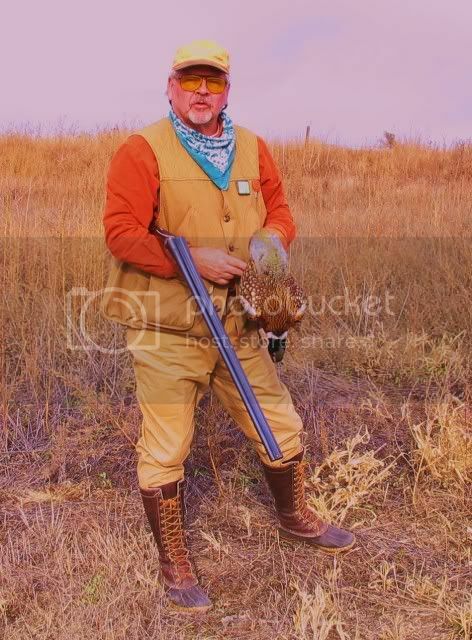 Old Hunter: Filson's chaps? I have used them here in Maine and out in Wyoming for 10-15 years and find they work very well. Obviously working for you as well. Old Hunter, That dish looks good. Whats your recipe? 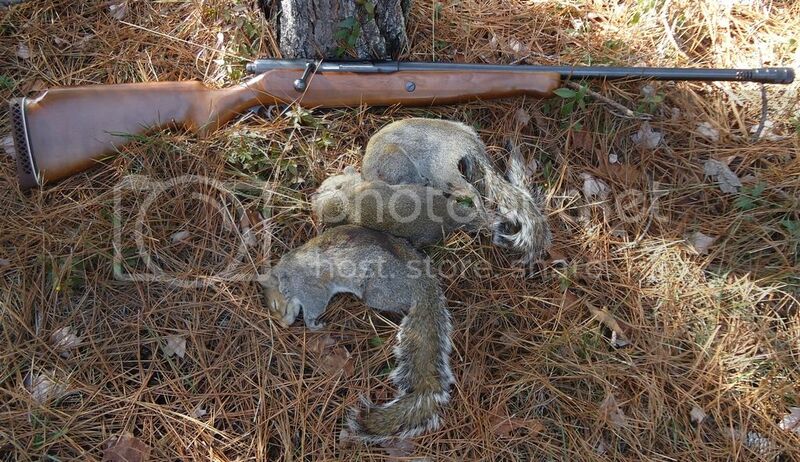 Decided to go "retro" yesterday on what may be my last squirrel hunt of the season. Took an old Mossberg 190-KA 16ga bolt action that I haven't carried in years. It was a cold, windy day but managed to get three. 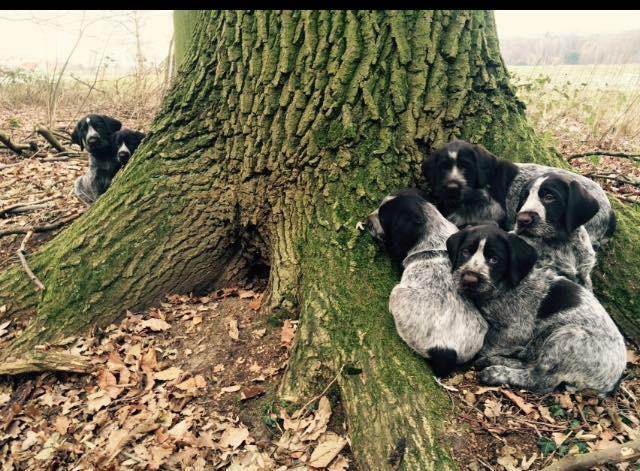 I don't think I've ever seen a litter where all the pups have such similar markings. They all look like winners to me. Congrats on your new pup. Let the adventure begin. Not a 16 ga. but here's a nice photo from a snowshoe hunt along a good pass a few weeks ago. I arrived late (actually the geese flew half hour early) and only got under one flock. A friend and I went earlier the next day and did real well but I forgot the camera! 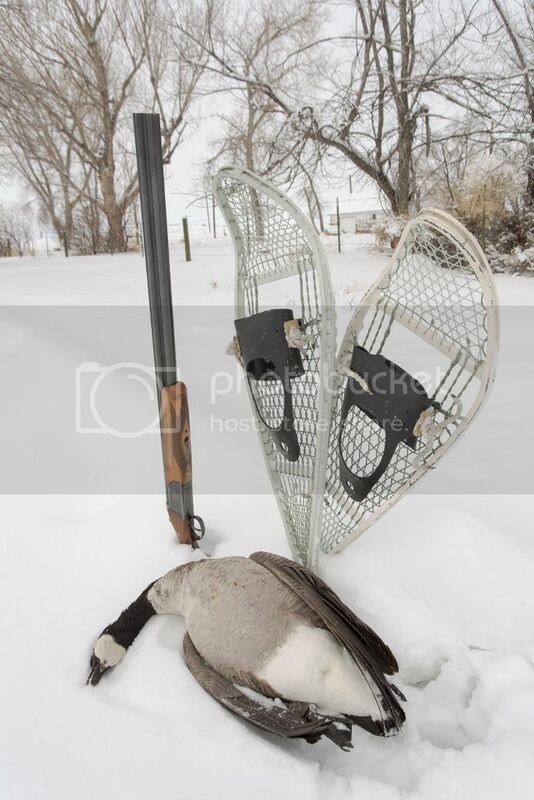 It's not very often anyone goes snowshoeing for geese. Winter has been a bit cold wet this year.